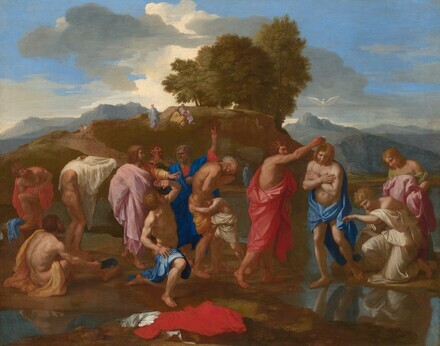 Although Nicolas Poussin's work exerted an enormous influence on the development of French seventeenth-century painting, the artist perfected his style in Rome, incorporating the lessons of Renaissance and contemporary Italian painters into his own idiom. Poussin's Baptism of Christ is one of a series of canvases illustrating the Seven Sacraments executed from 1638-1642 for his friend and patron Cassiano dal Pozzo. In Poussin's composition, the river Jordan winds through the foreground plane where he has placed thirteen figures. Christ is located to the right of the canvas; on his left side -- which represents paradise -- two figures, probably wingless angels, kneel to help him. To his right, on the earthly side of the Jordan, Saint John holds a vessel over Christ's head. The reactions of the figures to the right of Christ demonstrate why mastery of the human form was essential to history painting. The row of figures behind Saint John have anguished expressions and contorted poses. Poussin has depicted the specific moment when the voice of the Lord proclaimed: "This is my beloved son, in whom I am well pleased" (Matthew 3:17). By presenting complex poses and physiognomies, Poussin has evoked a very human reaction -- the fear of those present as they acknowledge Christ as the son of God -- thereby encouraging the viewer to identify with this significant moment. Commissioned by Cavaliere Cassiano dal Pozzo [d. 1657], Rome; by inheritance to his brother, Carlo Antonio dal Pozzo [d. 1689], Rome; by inheritance to his son, Gabriele dal Pozzo [d. 1695], Rome; by inheritance to his son, Cosimo Antonio dal Pozzo [died c. 1739], Rome; pledged by Pozzo to Marchese del Bufalo, Rome, as payment for debt [Bufalo offered his set of Poussin's Seven Sacraments to King Louis XV of France in 1729 when Bufalo ran into financial difficulties]; returned to Cosimo Antonio dal Pozzo, Rome, when debt paid, in either February 1730 or February 1732; by inheritance to his daughter, Maria Laura dal Pozzo Boccapaduli; by inheritance to the Boccapaduli family, Rome, who attempted to sell the series to Sir Robert Walpole [d. 1745], but export license was denied by the Pope; sold 1785 for the Boccapaduli family by (James Byres, Rome) to Charles Manners, 4th duke of Rutland [1754-1787], Belvoir Castle, Grantham, Leicestershire; by inheritance to his son, John Henry Manners, 5th duke of Rutland [1778-1857], Belvoir Castle; by inheritance to his son, Charles Cecil John Manners, 6th duke of Rutland [1815-1888], Belvoir Castle; by inheritance to his son, John James Robert Manners, 7th duke of Rutland [1818-1906], Belvoir Castle; by inheritance to his son, Henry John Brinsley Manners, 8th duke of Rutland [1852-1925], Belvoir Castle; by inheritance to his son, John Henry Montagu Manners, 9th duke of Rutland [1886-1940], Belvoir Castle; sold 1939 to (Wildenstein & Co., Inc., Paris, New York, and London); sold December 1944 to the Samuel H. Kress Foundation, New York; gift 1946 to NGA. The Seven Sacraments series, of which this painting was a part, hung in the main room of Cassiano's 16th century Roman palazzo on the via dei Chiavari, designated the Stanza de' Sagramenti, together with other paintings by Poussin and Jean le Maire. For a hypothetical reconstruction of the room, see Donatella L. Sparti, "Criteri museografici nella collezione dal Pozzo alla luce di documentazione inedita," in Francesco Solinas, ed., Cassiano dal Pozzo: atti del seminario internazionale di studi, Napoli 18-19 dicembre 1987, Rome, 1989: fig. 7; Donatella L. Sparti, Le collezioni dal Pozzo. Storia di una famiglia e del suo museo nella Roma seicentesca, Modena, 1992: figs. 53-57, cited in Elizabeth Cropper and Charles Dempsey, Nicolas Poussin: Friendship and the Love of Painting, Princeton, 1996: 112. For Cassiano's collection and the Pozzo inventories, see, among others, Marquis de Philippe Chennevières, Recherches sur la vie et les ouvrages de quelques peintres provinciaux de l'ancienne France, 4 vols., Paris, 1847-1862, reprint, Geneva, 1973: 3:149-155; Sheila Somers Rinehart, "Poussin et la famille dal Pozzo," in André Chastel, ed., Actes du colloque international Nicolas Poussin: Paris, 19-21 septembre 1958, 2 vols., Paris, 1960: 1:19-30 (who lists forty-one Poussin paintings owned by Cassiano in the appendix, cited in Colin Eisler, Paintings from the Samuel H. Kress Collection: European Schools Excluding Italian, Oxford, 1977: 273); Francis Haskell and Sheila Somers Rinehart, "The Dal Pozzo Collection: Some New Evidence," The Burlington Magazine 102, 688 (July 1960): 318-327; Arnauld Brejon de Lavergnée, "Tableaux de Poussin et d'autres artistes français dans la collection dal Pozzo: deux inventaires inédits," Revue de l'Art 19 (1973): 76-96; Timothy Standring, "A Lost Poussin Work on Copper: The Agony in the Garden," The Burlington Magazine 127, no. 990 (September 1985): 614-617; Timothy Standring, "Some Pictures in the dal Pozzo collection: Three New Inventories," The Burlington Magazine 130 (August 1988): 608-626; Sparti 1989; Donatella L. Sparti, "The dal Pozzo Collection Again: The Inventories of 1689 and 1695 and the Family Archive," The Burlington Magazine 132 (August 1990): 551-570; Sparti 1992, cited in Cropper and Dempsey 1996: 112. For discussion of Cassiano's broader interests and how his collection compared to other Roman collections at the time, see Cropper and Dempsey 1996. The painting was recorded as being in the Palazzo Doria Pamphili in 1733 and 1739, but it must have still been owned by Pozzo, as it passed to his daughter at his death. Byres arranged for copies to be substituted for the originals in Rome so that the originals could be smuggled out of Italy. See William T. Whitley, Artists and their Friends in England 1700-1799, 2 vols., London, 1928: 2:75-77. Lady Victoria Manners, "Notes on the Pictures at Belvoir Castle," Connoisseur 6 (1903): 136, states that the painting "was presented by George IV to the fifth Duke of Rutland as a substitute for the Sacrament of Penance, which is supposed to have been burnt in the disastrous fire of 1816." There is no evidence that George IV ever owned the painting, so this statement must be in error. During the preparation of the NGA systematic catalogue of its French paintings of the 15th through the 18th centuries, Joseph Baillio of Wildenstein & Co. kindly confirmed the year in which the company purchased the painting from the Duke of Rutland. The "memorandum of agreement" between Wildenstein and the Kress Foundation for the purchase of ten paintings, including this one, is dated 28 December 1944 (copy in NGA curatorial files). 17th Century Art in Europe, Royal Academy of Arts, London, 1938, no. 318, repro. Recent Additions to the Kress Collection, National Gallery of Art, Washington, D.C., 1946, no. 786. Poussin: Sacraments and Bacchanals. Paintings and Drawings on Sacred and Profane Themes by Nicolas Poussin 1594-1665, National Gallery of Scotland, Edinburgh, 1981, no. 37. Nicolas Poussin, Galeries nationales du Grand Palais, Paris; Royal Academy of Arts, London, 1994-1995, no. 69 (Paris) and no. 44 (London), repro. L'Idea del Bello. Viaggio per Roma nel Seicento con Giovan Pietro Bellori, Palazzo delle Esposizioni, Rome, 2000, no. 37, repro. Paintings and Sculpture from the Kress Collection. National Gallery of Art, Washington, 1945 (reprinted 1947, 1949): 154, repro. Frankfurter, Alfred M. Supplement to the Kress Collection in the National Gallery. New York, 1946: 55, repro. Cairns, Huntington, and John Walker, eds., Great Paintings from the National Gallery of Art. New York, 1952: 112, color repro. Paintings and Sculpture from the Samuel H. Kress Collection. National Gallery of Art, Washington, 1959: 338, repro. Cairns, Huntington, and John Walker, eds. A Pageant of Painting from the National Gallery of Art. 2 vols. New York, 1966: 2:288, color repro. Eisler, Colin. Paintings from the Samuel H. Kress Collection: European Schools Excluding Italian. Oxford, 1977: 271-274, fig. 250. Watson, Ross. The National Gallery of Art, Washington. New York, 1979: 72, pl. 58. Walker, John. National Gallery of Art, Washington. Rev. ed. New York, 1984: 317, no. 417, color repro. National Gallery of Art, Washington. National Gallery of Art, Washington, 1992: 163, repro. Hand, John Oliver. National Gallery of Art: Master Paintings from the Collection. Washington and New York, 2004: 178-179, no. 140, color repro. The Arts of France from François Ier to Napoléon Ier. A Centennial Celebration of Wildenstein's Presence in New York. Exh. cat. Wildenstein & Co., Inc., New York, 2005: 52, fig. 15, 71(not in the exhibition). Conisbee, Philip, et al. French Paintings of the Fifteenth through the Eighteenth Century. The Collections of the National Gallery of Art Systematic Catalogue. Washington, 2009: no. 83, 379-388, color repro. Vogel, Carol. "Inside Art: A Christie's Loss Is the Kimbell's Gain." New York Times 160, no. 55,523 (September 9, 2011): C23. Kimbell Art Museum. "Recent Acquisition: The Sacrament of Ordination by Nicholas Poussin." Calendar, February through August 2012: 17, color repro. Unglaub, Jonathan W. Poussin's Sacrament of Ordination: History, Faith, and the Sacred Landscape. Fort Worth, 2013: 21, color fig. 17.